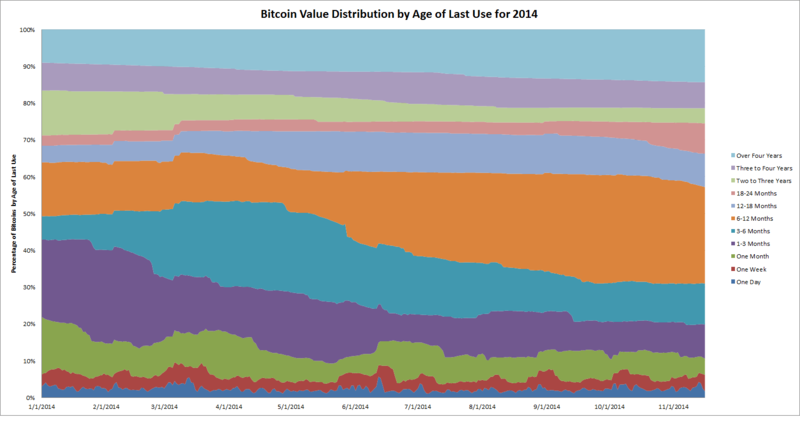 Share the post "Approximately 70% of all bitcoins have not moved in 6 or more months"
This entry was posted in Bitcoin, Cryptocurrency, Economics, The Anatomy by Tim Swanson. Bookmark the permalink. Isn’t it true that more.than 70% of all gold or even USD reserves in the world did not move during the same timeframe. I look at the amount of value being transmitted on the network and think it is remarkable. Bitcoin is both a currency and a store of value, so what is unusual about the store be that high? I find it remarkable how much of the market is liquid. Hi John. So what happens with fiat is that almost all of it is essentially deposited (saved) in banks who then relend it out creating circulation. There is nothing within the current Bitcoin protocol that enables this type of “savings” or “lending” to happen with Bitcoin. Perhaps it will change (as shown by the services being built outside the network). But, bitcoin holders are not savers in the modern sense because the token sits entirely idle, divorced from any financial flow. That is not necessarily a bad thing, but I think the advocates at conferences are not technically advertising the protocol correctly the way economists or financial analysts do, the protocol does not offer any service a bank does beyond a lock-box at this time. 1. As a form of “Gold 2.0” i.e. a value storage market. In this market, one would expect low movement and mentioned numbers are not problematic at all. However, bitcoin the currency is noncompetitive as Gold 2.0 simply because the network needs much higher transaction volume to survive. Low volume coupled with declining block rewards will bludgeon bitcoin in a few years. 2. As a currency for low friction global transactions: This aim is much more compatible with bitcoin the network. Ideally, volume grows and balances out declining block rewards. That the volume is not growing, and most bitcoins do not move is worrying. It is a bad sign because it indicates bitcoin is failing to take off as a transaction medium. 3. As a platform for other services like Counterparty: In this market, bitcoin purely serves as a foundation for other activities like decentralized dollar to apple shares trading. The problem here is that one can build much better – cheaper, faster and more scalable – technology to do the same. Hyperledger project is the perfect example. Bitcoin will be out-competed in this ‘platform’ market. So John, what market is bitcoin exactly targeting? And how do these numbers fit that market to make a coherent story? Gold is MANY things in today’s world, but almost nowhere is it actually “money” in the sense of mediating ordinary transactions. Any chance you could send me the raw data for this? The raw data is public. It’s all in the bitcoin blockchain. Transaction fees do not need to increase by a few orders of magnitude – transaction fee *revenue* needs to increase by a few orders of magnitude. This can be accomplished if fees per transaction remains the same and the number of transactions increases by a few orders of magnitude. Hi Justus, that scenario is not quite true. We know that in theory (as discussed in section 6 of the original white paper) an enormous — permanent — increase in tx volume coupled by some type of fee, could conceivably replace it. But empirically in practice, as more transactions occur off-chain, miners are not being rewarded for their services and continue to rely almost entirely (~99.7% as of this writing) on seigniorage. Could this change? Sure, but it would require a change in consume behavior away from free and towards either higher fees and/or more volume which simply may never germinate. Or course I mean higher transaction volume on-chain. Right now it’s impossible for on-chain transaction volume to grow to high enough levels to replace seigniorage because the protocol contains a built-in production quota. This is precisely why the production quote needs to be removed, in order to allow transaction volume to grow on chain to levels that support mining via transaction fee revenue. The high-fee, low volume won’t work for Bitcoin precisely because the high fees are an artifact of a production quota. Anyone could start a competing cryptocurrency with no production quota and order-of-magnitude lower fees and overcome Bitcoin’s network effect. The question is how will the low-fee high volume work when off-chain is / will prove to be more convenient? Any on-chain fee will be out-competed by speed, lower fees and convenience of off-chain transactions. Why exactly are we sure on – chain transactions will rise 10000 fold that it needs to? How exactly does Bitcoin solve this collective action problem? Neophyte stock investors often sell their winners (and incur capital gains tax, often at higher-rate short term rates) and hold on to their losers (tying up their money in dud stocks and forgoing tax losses). “Psychology” rather than “rationality” is usually cited. Experienced investors—with either longer time horizons or after the hot-heads have been Darwined out of the market—may do it a bit less, and institutional investors supposedly invest with more modeling of the stocks’ underlying worth, (also) supposedly show even less of this financially-foolish behavior. The fact that bitcoin transactions rise after the price has been rising suggests that the same n00b psych is at play here. The clear imputation is that no more than 30% of bitcoin is being used to facilitate transactions, while 70% is used speculatively or as a long-term investment. Others here seem to suggest that BTC needs a rising price for mining, and hence, fast transactions, to be economical. This raises the concern of an excess supply of mining equipment, but a shortage of transactions that need it. Sure wish I could see how that ends well. Can you do this analysis again?